When Carle from Nurturing Fibres asked me if she could use one of my photos as an inspiration for a special yarn, I was astonished and honoured. Little did I know on what kind of a journey she will take me with this idea. 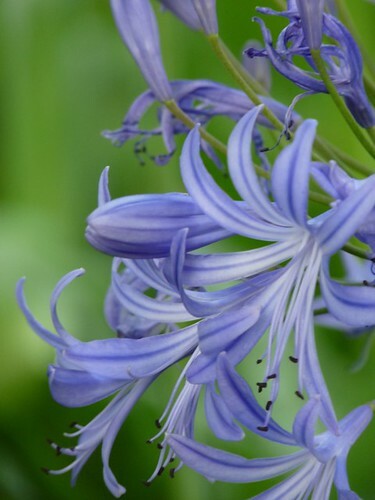 It was around the time when I started the Enchanted Gardens Project.... and also decided to start with the theme Lily of the Nile- or Agapanthus.When I spoke to Carle again, she told me that the photo she really loved was of an Agapanthus. A few weeks later 10 lucky people got the yarn. I know very little about dyeing. But when Carle was talking about the 40m warp and the different dye techniques used... I knew that this yarn will be even more special than her usual one of a kind sock yarns. (one of my favourite yarns). 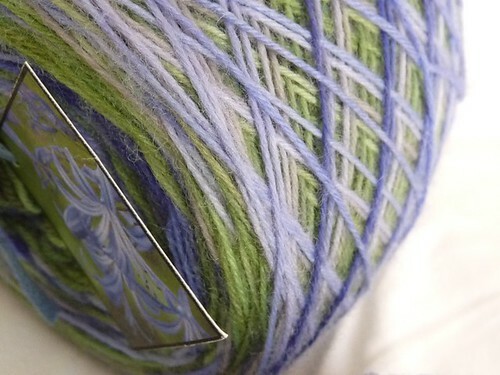 I did anticipate that I will do a shawl and ordered some extra semisolid wool too. I spent months thinking what pattern I should knit with this special yarn, then finally in May I started knitting a Daybreak Shawl. I am not sure if I did make the right pattern choice, I really love the pattern and enjoyed knitting it. But I feel that the stripes distract of the amazing dye.... I do however love wearing it, the drape and the colours are amazing. The pattern construction is well thought through and interesting, which makes this a very versatile piece. It is wonderful to see what the other 10 people are making with their yarns. All are different patterns and each looks completely different, despite the same yarn. I really enjoyed being a small part in the amazing creation of Carle. The journey of colour and fibre I was taken on was mind blowing and feel totally inspired by her interpretation of a simple photo! Oh my goodness! What a lovely photo and a lovely inspired piece. I love how she captured the colors! how wonderful! 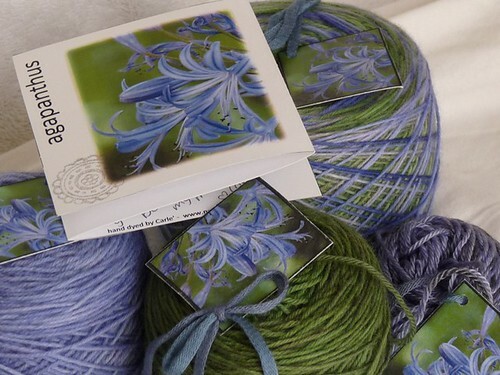 i love your photo, and the yarn that carle dyed is stunning. 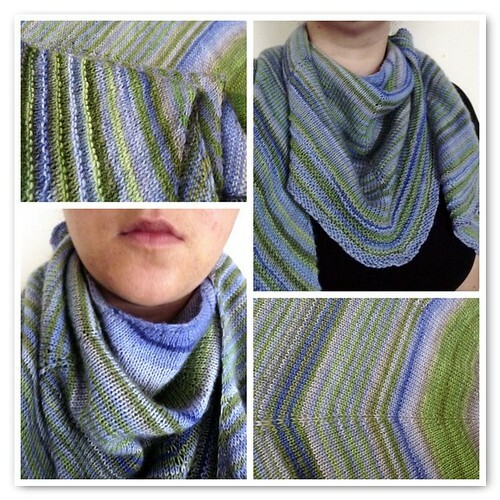 i think you made a great pattern choice: the shawl as a whole is beautiful, but you can focus in on the different hues on the stitches, which gives the shawl another dimension. bravo, all around! this is so wonderful! the photo and the yarn are so beautiful!!! love your shawl too! yeah for you that they used your photo! and i love the end results, and the shawl you crafted, really beautiful and lovely :) i love the fact that the internet can be so darn inspiring! What a fantastic story! The photo is of course gorgeous, as all yours are, and the yarn inspired by it is really lovely. And the shawl is a great choice I think - you've just given the colours room to breath and I think they sing out beautifully. 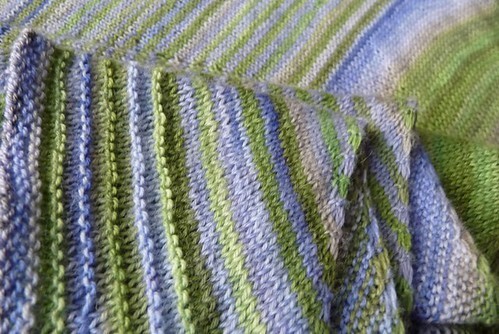 I like the stripes, the colours are so soft that they blend without the stripes looking too strong.